HESCH HISTORY: Don't they look familiar? Sibs Deb and Sandra are descendants of family we wrote about HERE and HERE. Sandra emailed in May 2013 to say the wedding picture on that second link is of their parents, Edward & Elenore Scherman ☺. 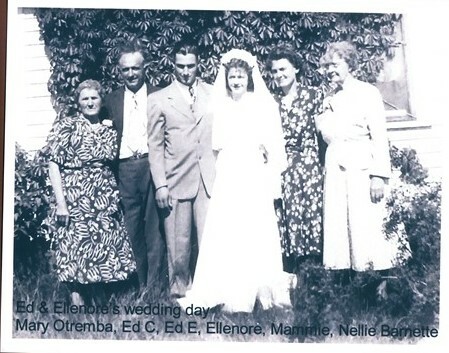 Edward's mom was Mamie Otremba Sherman, who's dad was Karl Otremba, son of Johann Otremba, brother of our Anton Otremba...so Karl was dad's grandma's cousin. Got that? (For the Genealogical Purists among us, the "common ancestor" we share with Deb and Sandra is Johann Georg Otremba (& Susanne Preussner) from Groditz, Tillowitz, Schleisen, Prussia). Even cooler is that I met them in Little Falls this week, and we drove over to Pierz, strolled the cemetery behind the church, and then went for pie, coffee and talk. It was great fun, and they're every bit as nice as they look. We sat and traded facts and stories for quite awhile, and I left feeling like we've known each other always. We come from good people, ya know?